Choosing yacht linen and towels is complicated. It needs to be durable, high quality and Co ordinate with the cabin decor. 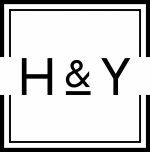 Home & Yacht Linen and Interiors are experts in this field and are here to help you. Bedding, table linens, and towels work hard on any yacht of any size. In the super and mega yacht end of the scale the linens are changed daily so they need to be durable enough to withstand this gruelling schedule whilst at the same time maintain their perfect finish and appearance. Linens should be chosen from a supplier and a range that will have continued access to the collection and style so that replacements can be sourced. Good suppliers will inform existing customers of any imminent deletions from collections to give clients the opportunity to top up whilst the style is still in production. Excellent suppliers will do this but also be have supplier relationships in place that allow deleted collections to be remanufacture on special order. Home & Yacht fall into the latter category and go that extra mile to keep clients inform whilst offering them total flexibility with recorders. Yacht Linens are ordered in large quantities. Home and Yacht recommend starting at three sets per bed, five sets for large high turn around yachts. Most bed linens are individually made to the right size and shape of each bed. It is important to get your supplier to keep these sizes on file for future refills and to tag each item with the cabin number. 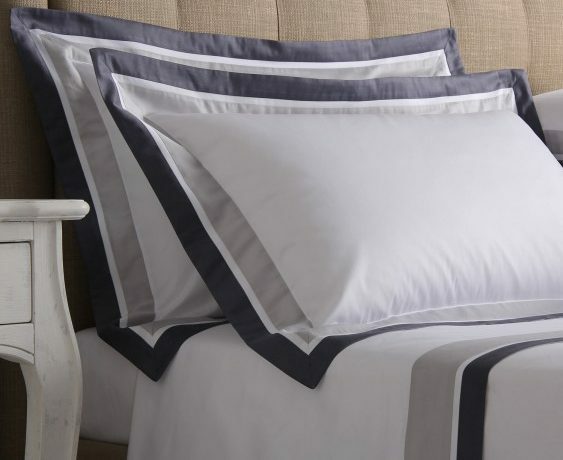 Egyptian cotton fabrics woven and finished in Italy are the best for any home and yacht. Egyptian Cotton is considered to be the best in the world. It’s long stable fibres make for strong durable yarn which can be woven to produce beautiful fabrics. Your supplier should be able to guide you through the thread counts depending on the owners preference for the thickness and hand of their linens. Italy is renowned for it weaving and fabric finishing so industry experts turn to Italian fabric houses when purchasing their fabrics. As we said, items finished in Italy are the best. Once the cotton yarn or thread has been produced in Egypt it is shipped Italy. The Italian skilfully weave, bleached and mercerised the fabric to produce an unequalled quality of fabric. After that the linens are produced to order. Home and Yacht provide all the top brands of world class linens such are Matouk, Yves Delorme, Schlossberg, Frette and Pratesi but also use their own in house workshop shops for small bespoke collections. Thread count can sound complicated. 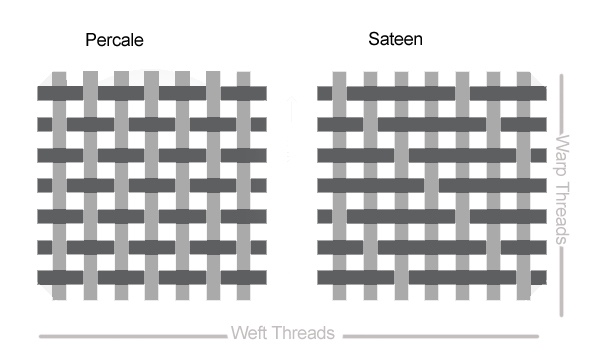 It should be remembered that Thread Count is only one factor that dictates the quality of the fabric. It should not be taken that a higher thread count fabrics it the best. The quality of the cotton fibres, where it was grown, the weather conditions at its time of growing, the thickness and quality of the thread all play their part in dictating the quality of the final item. Generally speaking when you’re dealing with linen experts you can be confident that the quality is fine and use thread counts as your benchmark Home and Yacht recommend a thread count of 300 to 600 for an owner cabin, and 200 to 400 for charter or crew. Most yacht require three styles of table linen: a breakfast set, a lunch service and a formal dinner set. Each set would consist of a table cloth, napkins and placemats. These would be complimented with napkin rings and table decoration items. Generally speaking the breakfast sets are less formal and softer and can be brighter shades. The lunch set should be suitable or their should be a set suitable for exterior use. Dinner service can be more formal. Napkins can be larger and the fabrics can have a heavier feel. Home & Yacht recommend keeping to a white base embellished with detailing or embroidery if required. However, they offer a wide variety of colours and finishes. Towels for yachts break down into two categories, deck towels and interior towels. Generally yachts have three sets of interior towels in three sizes: Shower, hair and hand towel. Face cloths and make up removing face cloths can also be added. Make up towels are a darker towel and can be embroidered with the words Make Up to encourage guests to grab these when removing make up rather than the fresh white towel. Soft white towels are easier to maintain. They don’t fade and can be replenished without any visable difference in shade. Deck and swimming towels are usually longer. Anything from 160cm long is perfect for a deck lowel. Although all fabrics fade in the sun even if they are treated with UV products white deck towels can be a little impractical. 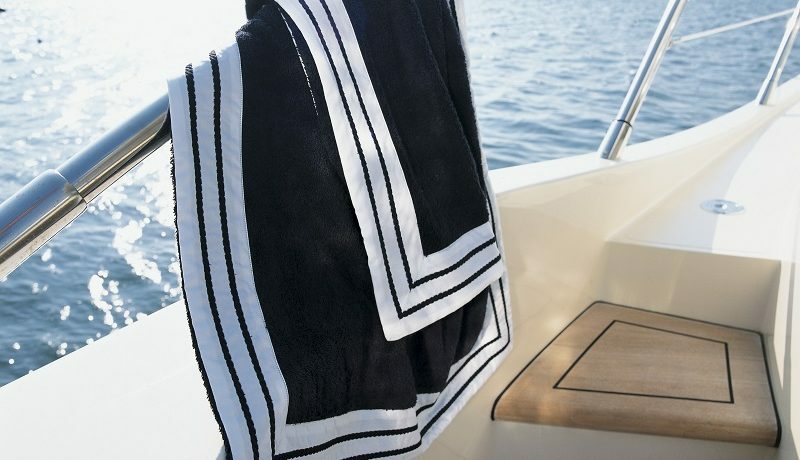 Home and Yacht recommend having bespoke deck towels embroidered with the yacht name. These would be changed and refreshed regularly as they on the front line of presentation when boarding and should always look their best.